In 2012, Portland Bolt provided fasteners used in the construction of new sectional steel canopies over the Boise Airport’s 355 rental car stalls. 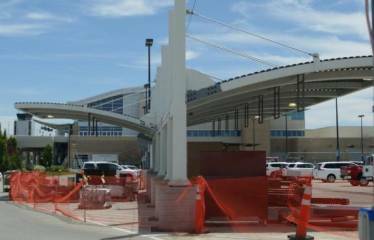 The project also featured the construction of a new entry canopy over the west entrance of the baggage terminal. Designed to shelter travelers from the elements, the canopies were designed to resist 90 mph winds and featured large tie rod braces consisting of ASTM F1554 Grade 55 rods. Portland Bolt manufactured nearly 200 of these Grade 55 tie rod assemblies in 1″, 11⁄8“, and 11⁄4” diameter. The tie rod assemblies ranged from 6′ to 10′ in length. As with all tie rod assemblies we manufacture, all clevises and rods were assembled prior to shipment to ensure that everything functioned correctly. In addition to the tie rod assemblies, Portland Bolt also provided close to 500 ASTM F1554 Grade 55 anchor rods in 11⁄4” and 11⁄2” diameters that were required for the concrete base columns to support the canopies. All told, Portland Bolt shipped 27,000 pounds of steel to the job in a two month timeframe! If you have a project that requires tie rod assemblies you should check out our handy Tie Rod Calculator. Unfamiliar with how tie rod assemblies work? If so, contact one of our experienced estimators today and we can help ensure that your project will get the tie rods it needs and that they will arrive on time and without defect!